UPPER PENINSULA — It’s an issue that has been growing over the years, and if it isn’t changed, it could negatively affect high school sports. As we near the beginning of another season in high school athletics, the need for officials persists. According to a January article from Mlive, the amount of officials in the Michigan High School Athletic Association has decreased to fewer than 10 percent of what it was over ten years ago. “Officials that are registered are not staying in the game as long as they have in the past. The average age of an official in the state of Michigan is about 52,” said Barry James, who has been registered as a MHSAA Official for 32 years. 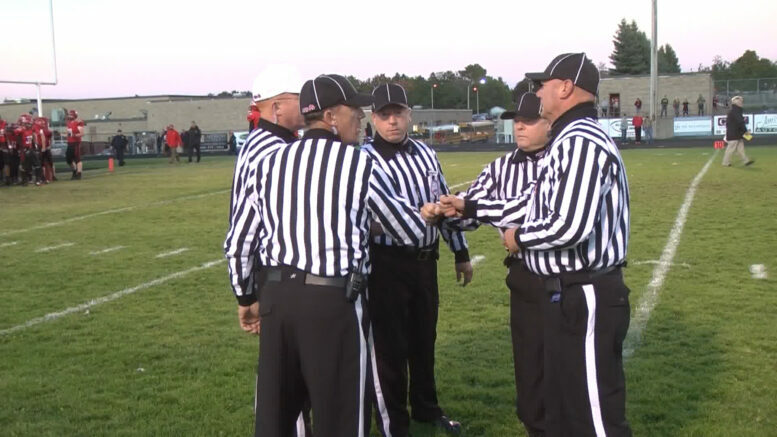 There are many factors that that a ccount for a referee leaving, some of which are out of the hands of the MHSAA. “Time away from family, travel to and from game sites, pay, dealing with fans and crowds can be an issue,” said James. The first two iss ues are major factors for James; he and his officiating crew are calling it quits after 32 years working together. It’s a lot of work for very little recognition. “A lot of people don’t realize what it takes to get to and from a game site, to leave work early, go officiate a game and get home at 11 o clock or at midnight for a high school football game, and I think that has impacted our reason to not officiate the game any longer,” said James. It’s easier said than done, but a good way to increase the amount of officiating in sports is to get athletes involved. Officiating is a great way to stay active and make some extra cash. But of course, life is ever–changing and sometimes officiating needs to take a spot in the back seat. “We’re starting to see officials leaving the game not in just football but other sports in the high school ranks, and I think that within the next 3–5 years there’s going to be high impact of officials leaving, and I think schools are going to have a difficult time finding officials to maintain and manage their contests. Not just in football, but all sports across the state, not just in the U.P.,” said James. If you are interested in registering to be an official for the MHSAA, you can visit their website. Poll: Which game should ABC 10 Sports feature this week during Friday Night Frenzy?